Ready for crop input control? Download our infographic to learn how ISOBUS can fit into your farm. Is your farm ISO ready? Integrating your implements doesn’t mean doing away with old equipment. With Field-IQ ISOBUS Control Solutions, you can select from a full suite of ISOBUS-compatible products that allow you to save money and get more out of the equipment you already own. Which common problem can ISOBUS solve on your farm? I bought a new planter that’s ISOBUS ready, but my guidance display can’t perform application control. You’ll need an ISOBUS-compatible display in order to take full advantage of your new planter’s features. Consider the Trimble GFX-750™ or TMX-2050™ display system. I bought a brand-new vehicle that’s autosteer ready, but it doesn’t give me application control on my implement. If your vehicle lacks application control, you need to ensure your guidance display and liquid control system are compatible. Consider pairing an ISOBUS-compatible guidance display — like Trimble GFX-750™ or TMX-2050™ — with the Field-IQ™ ISOBUS Liquid Control System. I have two tractors from different brands with two different guidance displays. I need to control one implement with both tractors. 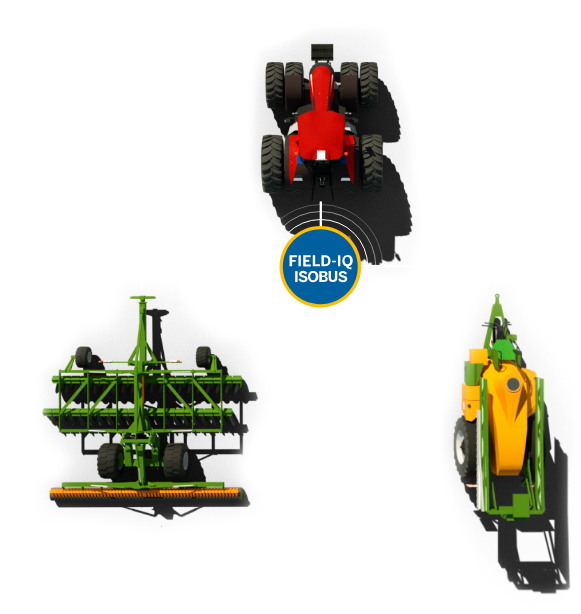 The Field-IQ ISOBUS Liquid Control System will allow you to control one implement with either tractor, helping you get the most out of your equipment. I bought a brand-new planter and tractor, but I need a liquid system that did not ship with what I bought. I still need to retrofit my planter to get a liquid control channel to work. For application control that works on multiple implements, consider the Field-IQ ISOBUS Liquid Control System. Different systems have different capabilities, making application control a concern for many growers. ISOBUS allows your farm equipment to communicate regardless of the brands you use by providing compatibility between a console and multiple types of implements.